For more than 15 years the letters “SPX” have been synonymous with professional multi-effect processors, and over that time you would almost always find an SPX90, SPX90II, SPX900, SPX1000 or SPX990 in any well-equipped studio or live-sound rack. The Yamaha SPX2000, while inheriting the standard interface and popular programs from its predecessors, brings a new dimension to the SPX sound with advanced REV-X reverb algorithms and 24-bit, 96k-Hz audio processing. It also offers an innovative user interface with features such as five assignable LCD backlight colors, operation lock modes, and computer-based editing. The Yamaha SPX2000 is a new-generation multi-effect processor that delivers performance that is a perfect match for Yamaha’s DM series Digital Production Consoles, and is suitable for applications from live sound to production studios. The heart of the Yamaha SPX2000 hardware is a 96-kHz DSP LSI with 32-bit internal processing (58-bit accumulator) that delivers plenty of processing power for the unit’s advanced effect algorithms. 24-bit, 128-times oversampling AD and DA converters achieve 106 dB dynamic range and flat response from 20 Hz to 40 kHz at the 96-kHz sampling rate. The Yamaha SPX2000 memory is organized into three banks: “PRESET,” “CLASSIC” and “USER.” The PRESET bank contains 97 programs, 17 of which feature Yamaha’s acclaimed REV-X reverb algorithms. REV-X reverb programs deliver the richest reverberation tone and smoothest decay available. There are separate REV-X Hall, REV-X ROOM, and REV-X PLATE algorithms, and corresponding new parameters such as ROOM SIZE and DECAY ENVELOPE that contribute to higher definition and finer reverb nuance. The other 80 presets are popular SPX programs such as gate reverbs, delays, pitch effects, modulation and other special effects. Other advanced algorithms … such as Multi-band Dynamic Processors … are inherited from the DM series Digital Production Consoles. All programs have been created through detailed listening and editing by leading engineers. 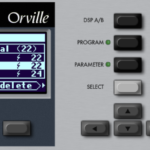 The “CLASSIC” bank contains 25 programs reminiscent of the original presets from early SPX models such as the SPX90II. The “USER” bank can store 99 user programs. The SPX2000 is designed for maximum operability and reliability in any situation. The rugged aluminum front panel features 2 sets of intuitive cross-keys for easy navigation and editing. Parameters are arranged into 3 groups: PARAMETER, FINE PARAM, and UTILITY for speedy access. Other dedicated control keys … UNDO, COMPARE, BANK, MODE, METER, TAP, and BYPASS … ensure efficient operation. For striking visual contrast and easy identification, the Yamaha SPX2000 LCD has five backlight color variations. Any of the five colors can be assigned to user programs as required. The preset programs are color-coded by effect group for instant identification: cyan for reverbs, white for delays, magenta for pitch & modulation, yellow for others, and green for the CLASSIC bank. Red is reserved for warning messages. There’s also an OPERATION LOCK function that offers 3 security levels to prevent accidental utility setting changes, protect stored memories, or to prohibit almost all operations.